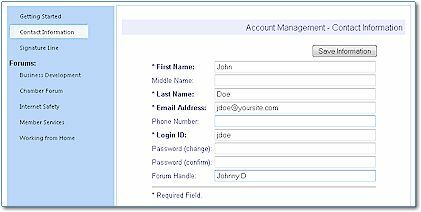 Users maintain their own profiles of contact information similar to what they used to register for access. In addition, they can maintain a signature line that is appended to discussion post either when they enter a post online, or when they send a post via email. Users also maintain their personal settings for each forum they have access to. This includes registering for forum newsletters, announcements, and discussion posts. In upcoming versions of Communities OnTheWeb, we will be offering extended personal profiles to include advanced options such as Avatars, favorite sayings, and additional preferences. User rankings will also be implemented to recognize active and valued participants in your site. Users will be able to vote on the relevancy of posts, which will be used along with other data such as frequency of visits to you site to rank users. Special content gadgets will be able to highlight top users on the site and within forums.